I've lost 14 pounds so far!! This diet has me searching for long-term maintenance ideas. I found some healthy snack options Diabetic Living. SWEET! 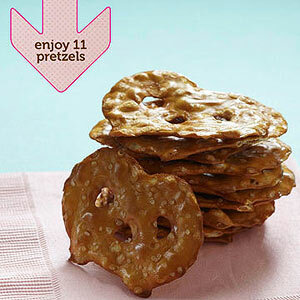 The bonus with choosing thin, crispy pretzels rather than a big sourdough hard pretzel is that you get 11 pretzels instead of one for about the same calories and carbs. That gives you a lot more chewing action, which may better satisfy your appetite and urge to munch. 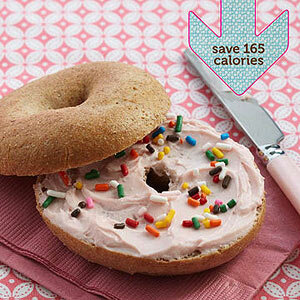 Mini whole wheat bagel with strawberry reduced-fat cream cheese (1 topped bagel = 155 cal., 28 g carb., 3 g fat, 7 g pro.) The carb, fat, and calorie counts of most doughnuts don't fit very well into healthy eating plans. A mini whole wheat bagel with a smear of strawberry reduced-fat cream cheese gives you a sweet, chewy treat that's a good source of fiber and protein. Feeling festive? Go ahead and scatter a few rainbow sprinkles on the cream cheese. Tootsie Roll Pop (1 pop = 60 cal., 15 g carb., 0 g fat, 0 g pro.) instead of M&M's (1/4 cup = 256 cal., 37 g carb., 11 g fat, 2 g pro.) 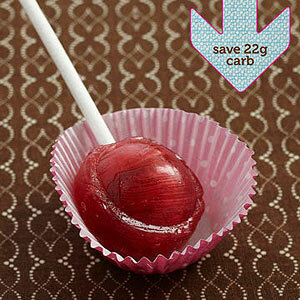 When nothing but chocolate candy will do, go for a lollipop with a chocolaty center. Pizza Kabobs: On a skewer, string half of a Mini Babybel light cheese round, 4 slices of pizza-style Canadian bacon, and 2 each of cherry tomatoes, white mushrooms, green pepper wedges, and 1-inch cubes of Focaccia or French bread. Brush assembled skewers with light Italian salad dressing, and broil or grill until vegetables are tender. 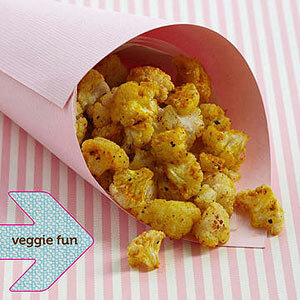 Serve with heated pizza sauce. 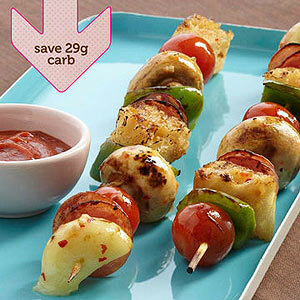 Pizza kabobs give you the pizza flavor you love without the heavy hit of carbs from the crust. With these options, I think I might be able to actually stay healthy! All info & photos belong to http://www.diabeticlivingonline.com/ . I think I may try the grilled pizza kabobs thing, since it is grilling season and all!